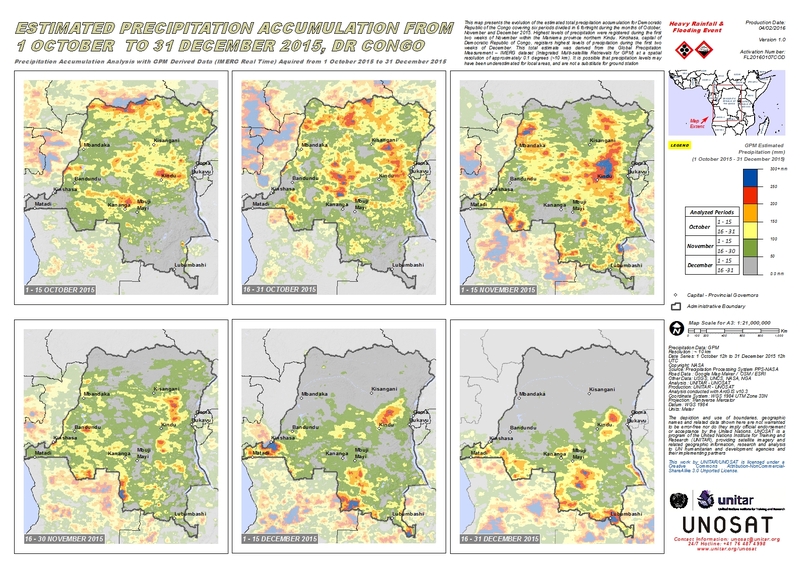 This map presents the evolution of the estimated total precipitation accumulation for Democratic Republic of the Congo covering six periods divided in 6 fortnight during the months of October, November and December 2015. Highest levels of precipitation were registered during the first two weeks of November within the Maniema province northern Kindu. Kinshasa, capital of Democratic Republic of Congo, registers highest levels of precipitation during the first two weeks of December. This total estimate was derived from the Global Precipitation Measurement ? IMERG dataset (Integrated Multi-satellite Retrievals for GPM) at a spatial resolution of approximately 0.1 degrees (~10 km). It is possible that precipitation levels may have been underestimated for local areas, and are not a substitute for ground station measurements.